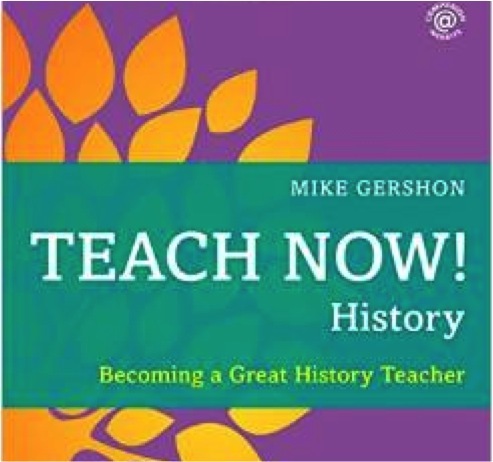 It is always exciting when a new book comes out on history teaching, and I was therefore keen to get my hands on a copy of Mike Gershon’s new book Teach Now! History, part of a series edited by Geoff Barton and including books written by Alex Quigley and Tom Sherrington. History education is a highly complex field, and there are already a number of quality publications available targeted at new and early-career teachers (Davies, 2011; Husbands & Kitson, 2012; Harris, Burn & Woolley, 2013). It is important, nonetheless, that we keep pushing our professional knowledge base, and so I was excited when Gershon’s book came through the post. After reading the book, however, my enthusiasm and interest turned to disappointment, and then despair. Although there is still a wide range of practice ‘out there’, I would nevertheless say that history education has moved on in a number of ways over the last twenty years. Sadly, there is very little in this book that reflects these changes. A good example of this is how sources are used in the classroom. The section on using sources in this book begins with a conceptual error where Gershon treats the words ‘evidence’ and ‘source’ as synonymous, where really he should be stressing that things that survive from the past (sources) get used as evidence in response to some particular question. This conceptual misunderstanding is revealed in the activities on p.10, all of which I, as a mentor, would be criticising trainees for doing. The idea that pupils can judge the ‘limitations’ or the ‘relevance’ of a source without going in with a question in mind has been shot out of the water by history teachers over the last twenty years. Gershon shows another conceptual error on p.12 where he states that sources possess a property known as ‘credibility’. They do not. Historians ascribe credibility to an author; credibility is not an inherent property of a source. The conceptual misunderstandings in the book shine through in the kinds of activities recommended for using sources in the classroom. Gershon suggests activities such as getting pupils to score sources based on ‘bias’, ‘reliability’ and ‘utility’, an approach to history teaching that has been criticised consistently, coherently and relentlessly across the pages of Teaching History since Lang’s 1993 article ‘What is bias?’. On p.69 Gershon encourages teachers to get students ‘analysing sources for bias’, despite all the collective professional critique that has been made of this kind of activity. Gershon may disagree with these criticisms and may wish to defend the kinds of tasks he advocates, but it is very strange indeed not to mention this critique given its scale and longevity. My guess would be that he simply has not read any of the work written by history teachers on this matter (see Lang, 1993; McAleavy, 1998; Byrom, 1998; Riley, 2000; LeCocq, 2000; Howells, 2000; Smith, 2001; Mastin, 2002; Woolley, 2003; Card, 2004; Hammond, 2007; Pickles, 2010; Pickles, 2011). A similar ignorance arises when Gershon is writing about chronological and thematic approaches to teaching history. He does make a perfectly valid point that teaching chronologically and teaching thematically are not absolutes, but he does nothing to draw upon the rich work done on this, particularly in the last ten years. It is shocking that no reference is made to ‘Usable Historical Pasts’ or any of the publications, including those made accessible to teachers, that came from this (Howson, 2007; Howson, 2009; Howson & Shemilt, 2011). Again, there is no engagement with any of the work produced by history teachers on how to handle chronological and thematic structures in the classroom (Riley, 1997; Dawson, 2004; Dawson, 2007; Gadd, 2009) nor is there any reference to the considerable corpus of work produced by history teachers and researchers on managing the relationship between overview and depth in a curriculum (Banham, 1998; Banham, 2000; Jenner, 2010; Blow, 2012). I am not suggesting here that this book necessarily needs to be a densely-referenced academic tome, but the lack of engagement with history teacher professional discourse shown by this book – even for a simple introduction – is staggering. The chapter on differentiation is very worrying indeed. Writing frames, for example, are recommended as a strategy for supporting pupils doing extended writing. There is zero reference on pp.90-91 about the arguments for and against writing frames, and there is certainly no reference to any of the work done by history teachers on this. It is inconceivable, for example, to write about writing frames in history without referring to Evans and Pate’s now classic 2007 piece ‘Does scaffolding make them fall?’ Counsell’s (2004) work on extended writing in history and the problems of over-structuring writing for students is seminal, and yet receives not a word of reference in this book. This is not to say that writing frames are necessarily a bad thing; like all tools, it rather depends on how they are used. But to offer writing frames as a quick-fix solution, devoid of any critique, does nothing to prepare trainee history teachers for the classroom. One of the major failings of history teaching in the late twentieth century was the introduction of hugely over-simplified and ahistorical ‘empathy’ exercises. Despite the fact that this approach has been extensively critiqued in the literature written by history teachers and researchers (Cunningham, 2004; Dawson, 2009; Lee & Shemilt, 2011; Smith, 2013), Gershon nevertheless recommends on p.37 that new teachers ask students ‘to write a series of diary entries in the guise of a character connected to the topic of study’. I always advised my trainees against doing this kind of task when I was a mentor because it is so very, very difficult to do this in a meaningful way. If nothing else, a pupil needs extensive knowledge of the period in order to be able to do this. Gershon should be flagging this up as, at the very least, a potential problem. There are numerous other problems with the book. Bloom’s Taxonomy is offered as a tool for lesson planning with absolutely no recognition of the problems associated with this in history; it is offered uncritically as the tool for lesson planning. Gershon makes a complete hash of ‘formative’ and ‘summative’ assessment, and provides grossly over-simplified definitions of ‘criteria-’ and ‘norm-referencing’. On p.63 Gershon states that he ‘always’ uses past-exam questions for assessment purposes when teaching exam classes, a clear encouragement to new teachers to teach to the test. Exam mark schemes are linked to Bloom’s Taxonomy, and no critique is made of the limitations of these marks schemes and the perversions their use can create in the history classroom. Despite an almost sensible end-of-chapter activity on p.58 on what we might expect of pupils in Years 7, 10 and 13, the book elsewhere is pretty much devoid of any definition of what ‘progress’ in history looks like and how progression in learning history might be modelled; this is all the more surprising given the large quantity of work that has been done on this (Wineburg, 2001; Wineburg, 2007; Lee & Shemilt, 2003; Lee & Shemilt, 2004; Bradshaw 2009). I could go on. There are many, many bloggers who would take issue, for example, with the chapters on behaviour (the end-of-chapter activity on p.129 encourages new teachers to compare rules in the classroom to UK Supreme Court rulings and disagreements with these) and observations (in which Ofsted plays a role on p.138). One possible response to my critique here is that this is a book for novices, and that to pack it full of references to things written by other people would make it less accessible. I do see the point of this, yet I would not think this a particularly strong defence because (a) there are references to various generic educationalists in the book such as Bruner and Vygotsky, (b) it is patronising to think that someone with a degree cannot cope with a more complex introduction, (c) the lack of reference to wider developments means that the advice given is out-of-date and (d) it leaves trainees unaware of, and thus unprepared to handle, the major lines of debate in the practice of history teaching. This book, sadly, completely fails to distil this complex field into something meaningful, and does not provide a new history teacher with even the basic knowledge that they might require to operate as an informed professional. The bibliography in this sense is perhaps the most telling symptom: there is not a single reference on it to anything published in the field of history education (though there are six references to the author’s other books). If we, as teachers, are to have any hope of seeing ourselves as a profession, then we need to have a clear, codified knowledge base which grows over time. History teachers – perhaps more than in any other subject – have been working hard on this for the last twenty years. A professional community is a little like a dinner party conversation, where individuals join, spend some time working out what’s being discussed, add their own contributions, and then eventually leave with the conversation continuing. 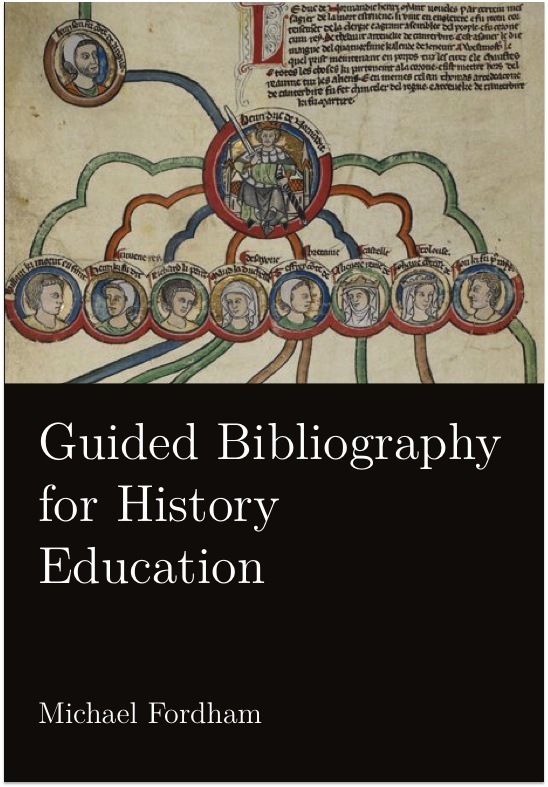 Perhaps the simplest comment that can be made about this book is that in no way is it a contribution to the professional knowledge base of history teachers, nor does it provide any guidance as to what this knowledge base looks like. Goodness me, that was brutal! I feel quite bad for writing it – but I don’t think I’ve been unfair, and it needs to be said. But I still feel bad! I think there is a niche in the market that you should fill, Michael. In many ways this is powerful post. Firstly, you’ve provided a tremendous reading list for history teachers and, secondly, you’ve given the pointers on the issues that we should all be aware of. I can appreciate your feelings – after all, writing any book takes time and commitment and no-one wants to trash that. But it does sound as if the book was misconceived from the very start and the publishers should be asking themselves some serious questions about their commissioning process. You said what had to be said and in so doing you are serving the wider history education community. Good for you! Was always envious of quality of history teaching in schools I’ve worked in, and whilst I know very little about how to teach history, I think I have a good idea what a comprehensive professional knowledge of ideas about teaching a subject might look like, and this is it. Thank you for the inspiration. I entirely agree with Michael’s overall critique of Teach Now – History but it may be worth commenting on his sense of chronology, largely because, being vastly older, my memory is longer than his. One of many virtues of Teaching History under present editorial leadership is its recording of the history of history teaching but the absence of such meticulous recording of ideas and developments before the mid-90s demonstrates that history teaching is as vulnerable as other kinds of history to the vagaries of the survival of evidence. It’s easy to identify trends from the mid-90s onwards in Teaching History, harder before that as it was a different kind of journal then. This means that it can be harder to identify some of the foundations from the 70s and 80s that the 90s built on. For example, Colin Shephard and I separately ran numerous workshops in the late 80s and early 90s (including at HA and SHP conferences) on using enquiry questions to give coherence to courses and build a sense of enquiry but I suspect there’s little or no documentary evidence of these developments. Somewhere in an old file I recently spotted a single A4 sheet on this but it’s not quite the same as a foot-noted article! To pick up a couple of specifics – ahistorical empathy exercises were around in the 60s and 70s and probably earlier and were being heavily criticised in the 70s (for example by everyone connected with SHP, me among them) so I can’t see this as a feature that developed “in the late 20th century”. I also well remember, in the late 70s, sitting in exam meetings when scorn was poured on those who confused ‘sources’ and ‘evidence’. I became quite obsessive about monitoring my language in case I fell into that trap and became the recipient of pitying glances! But of course every decade has its successes and its errors and misconceptions. Lots of things could have been done better back then in the ‘olden days’.The trick is trying to spot the problems at the time, usually the unintended consequences of good intentions. That said, it’s one thing bad practice being criticised by those who’ve had the benefit of good training and CPD, it’s quite another to bring such critiques to the attention of teachers who’ve not had those advantages. Unfortunately those advantages are becoming rarer. Many of the successes in history teaching have come about because of the excellent training provided by the nation’s university-based PGCE courses in which trainees have gained lengthy school experience and have been able to place those individual experiences in wider contexts through contacts with tutors, mentors and fellow-trainees. The dismantling of PGCE courses and their replacement by other forms of training (‘justified’ by the straightforward lie that university training consists largely of lectures on teaching) can only see a decline in the quality of history teaching. What will the consequences be? One danger is the development of a greater gap than ever before between the well-trained who appreciate the importance of good CPD and continue to attend conferences and those who’ve never had the chance to see over the parapet of a single school’s experience? Will those finessing away at the cutting edge of the discipline have less and less in common with the ‘ordinary teacher’ – a dangerous gulf to build up? If so, how can such a gap be limited or reduced? Is there a need for less time at major conferences on cutting edge workshops and more provision of catch-up sessions for those deprived of effective training? Is there the equivalent of a good PGCE programme available on-line – I suspect that much of that is available but would it help to have guidance along the lines of ‘start here, then do this, move onto that’ otherwise new teachers face the challenge of trying to sort out the best programme and sequence for themselves. Hopefully better and younger minds than mine have got this in hand. Time to go back to watching the cricket. Fascinating post- I have a lot of reading to do! Can I ask what you feel the limitations and perversions are, that Bloom’s taxonomy can cause in history class rooms? I’ve written a short post explaining my views on Bloom’s – http://wp.me/p3JKe3-8C. Michael, I’d be very interested to hear what general books you would recommend for History teachers. Would ‘Learning to Teach History in the Secondary School’ arguably be the best starting point?